I was over the moon when Mélanie from Filles à Maman contacted me to be a part of her Mimi pattern tour. I had watched during the testing phase as her testers came up with so many different looks. And, now I am enjoying seeing all the great Mimi Tops and dresses so far on the tour and looking forward to seeing many more. Look at the great line up of talented seamstresses! It took me a long time to decide which of the pattern's options I wanted to use. In the end I decided to go with the top version and the asymmetrical collar and long sleeves. We have just entered winter here but it is not really very cold yet. I envisioned a garment that could be layered as it gets cooler. Look at the asymmetrical collar and keyhole neckline. I used a jersey knit as the main fabric then for the top of the collar and facings I used pink jersey and the underside of the collar is black jersey. I added a hot pink button as the keyhole closure. By using the pink for the facings I got little glimpses of pink when she wore it. I made the top in size 2 and it fit beautifully. The top is a bit longer than a regular T-shirt so it will work nicely with leggings and there are instructions on how to lengthen or shorten it to your liking. I made the standard top length but wanted it a little shorter to sit well with the twirly skirt I made. So I decided to add ruching to the sides. The pic below shows how I went about that. I cut a short length of 1/4" elastic and lined it up with the side seam just above the facing. Then I did a little zigzag to hold it in place. I then lengthened my zigzag stitch and sewed along the elastic while stretching it out. I then applied a little steam from my iron and it ruched up nicely. I made a Boo! Designs Twirly skirt in solid pink and paired it with grey leggings and black boots. We went shopping for boots just for this outfit but I suspect they'll get a lot of wear this winter, she loves them. I think it could easily be paired with leggings alone, or a pair of skinny jeans. Eloise insisted we get some sitting down photos too. I can't get over the shot below. She is such a natural at posing for photos. I just love this pattern. It is quick and easy to make, comfortable to wear and very trendy. I also love that it is so different to other patterns and to store bought tops. The pattern is well drafted and the instructions are easy to follow. There are lots of options to choose from too. 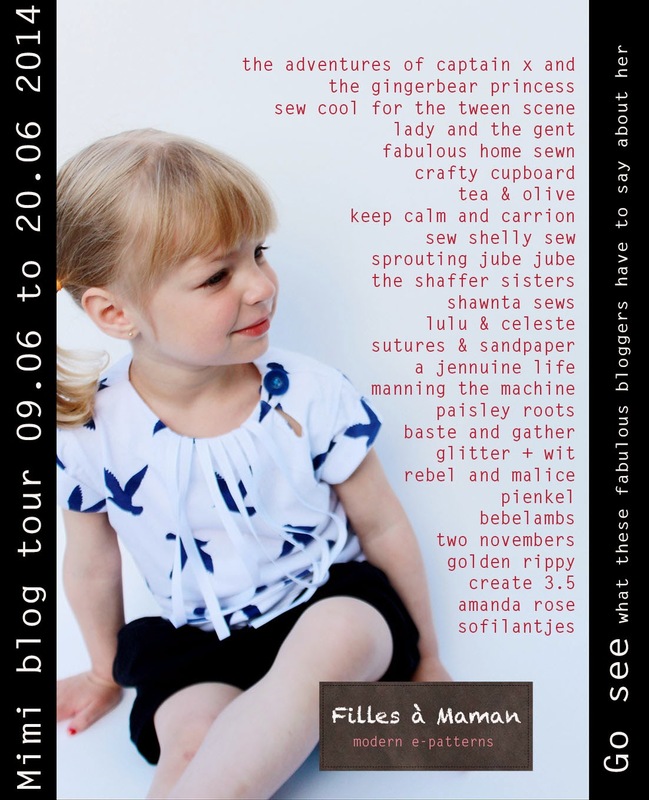 Please pop over to Filles à Maman and check out all the other bloggers in the tour. You can buy the pattern here. I recommend it for beginner and advanced seamstresses alike. To make it even better there is a discount code: MIMITOUR20 for 20% off. Oh, and enter below and you could win 5 Filles à Maman patterns of your choice!!! It looks absolutely great!!! love it!